Hoping to expose fatal flaws in the American legal system, writer Tom Garrett places a bet that he can have himself convicted of murder on purely circumstantial evidence by planting false clues at a crime scene, before sensationally revealing his trick at the last minute. However, a series of disastrous coincidences leaves him facing execution – and a frantic search for the true killer begins. This ingenious plot was the basis for Beyond a Reasonable Doubt, Fritz Lang's last film in Hollywood before returning to Germany to make the two-part Indian Epic, recently released on UK DVD by Eureka, and is regarded by many as a companion piece to the same year's While the City Sleeps, which was also directed by Lang and based around a newspaper office. 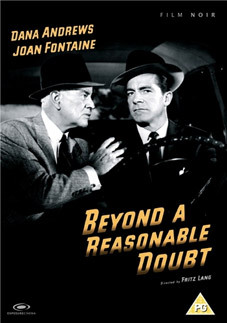 Beyond a Reasonable Doubt was written by Douglas Morrow (most of whose work was in televsion on series like Waterfront, 77 Sunset Strip and Mister Roberts) and stars Dana Andrews and Joan Fontaine, and boasts a nicely-judged twist that was infuriatingly given away by Leslie Halliwell in his once-revered Film Guide because he wasn't that fond of the film. We, however, liked it a lot. Beyond a Reasonable Doubt will be released on UK DVD by Exposure Cinema on 23rd July 2011 at the RRP of £11.99.